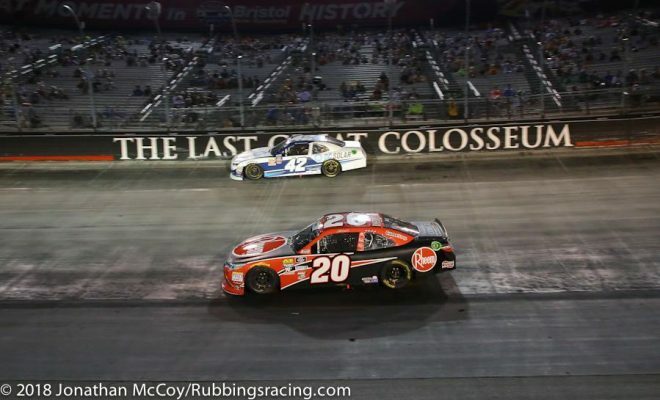 Victorious in the Food City 300 — for the first time in his career, Kyle Larson is a winner at Bristol Motor Speedway. 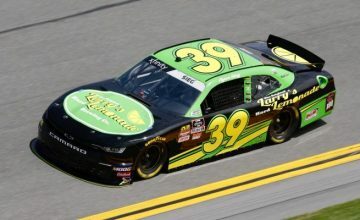 Leading 202 of the 310 laps run — the scheduled distance was 300 laps — Larson collected his fourth win of the season in the NASCAR Xfinity Series and amassed his eighth t0p-10 finish in the nine races. “I haven’t started looking for a broom,” said Larson, referring to a potential sweep of his races this weekend. “I got half the job done. It’d be awesome to get two wins here this weekend. Earlier in the evening Larson qualified his No. 42 Monster Energy NASCAR Cup Series Chevrolet Camaro ZL1 on the pole for Saturday’s Bass Pro Shops NRA Night Race. Between the NXS win and the MENCS pole, Larson may have the most momentum he’s had all season. 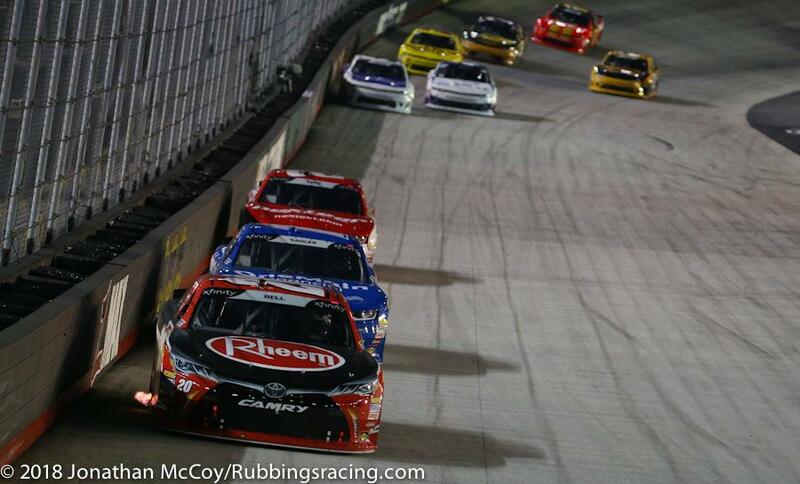 Kyle Larson drives around the rim of the race track during the Food City 300. Photo by Jonathan McCoy. The current Joe Gibbs Racing prodigy, Christopher Bell finished in second. He was Larson’s biggest challenger throughout the race and his finish made him the highest placing rookie of the race. It’s his 14 top-10 in 22 races. 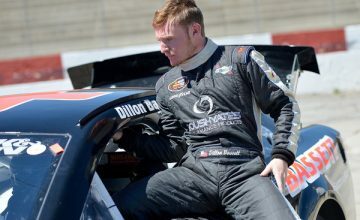 Bell has stated this week he intends on running for the NXS championship, again next season, but he’s also made it apparent that he’s ready to race with the stars. Like Larson, he has an affinity for dirt racing. He battled Larson for the lead during this year’s Chili Bowl before Larson was regulated by a souring engine. Bell leads Elliott Sadler down the back stretch. Photo by Jonathan McCoy. Bell led the race for 18 laps and was the only driver to pass Larson for the lead under green flag conditions. The 20-year-old may not have won the race but he was relishing every bit of the action on track. 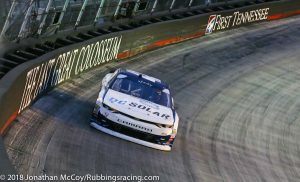 “I was smiling inside my helmet so big,” said Bell, this is the first time I’ve gotten to run the real Bristol where the top rubbers in and you get going around there pretty good. 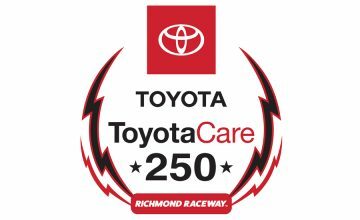 The other well known Kyle, Kyle Busch, started the race by leading 69 laps, but would retire from the event after being the reason for caution on lap 71. Busch was running the outside line of the race track when his No. 18 slipped up the race track and glanced off the SAFER barrier. Soon after he cut a tire and pounded the outsider wall.